Hugh Fearnley-Whittingstall's Veg Everyday cookbook is one of my favourites. Even Jerry has been known to compliment a meat free meal made from it's pages (no small feat). Several of his recipes call for pearled spelt, but I have never been able to track any down. Pearled spelt is dehulled, but then goes though an extra process to scratch the surface of the grain to facilitate water absorption (and therefore dramatically reduce cooking time as well). Recently one of my net-buddies has started an online food store, The Mindful Trader*, and she invited customers and potential customers to request items we would like to see stocked in the store. Sensing the opportunity to set a challenge, I nominated pearled spelt. Lo and behold a few weeks later a supplier was found and it was in stock. I placed an order. 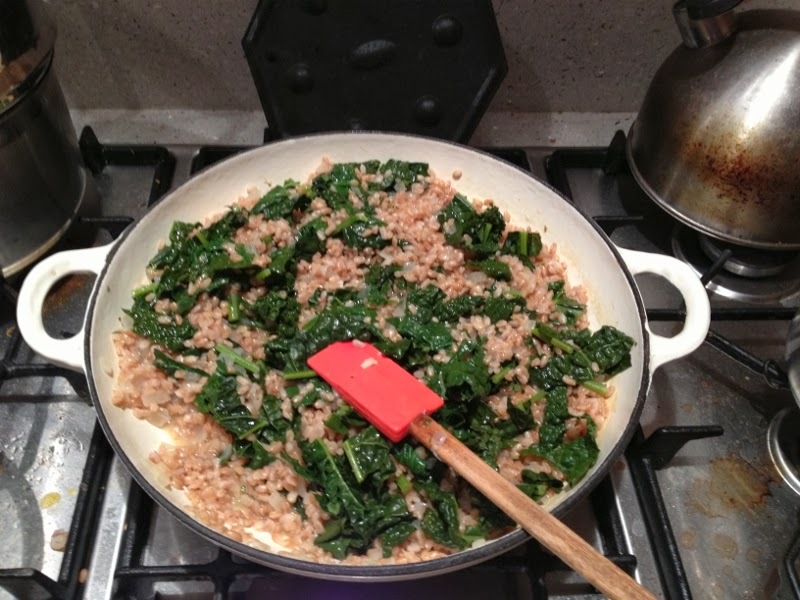 My first cooking with pearled spelt attempt was Speltotto - like risotto but, you guess it, with spelt. I've linked to the swede version of the recipe, but I made my speltotto with kale. Basically follow the recipe, but ignore the swede part, and in the last 2-3 minutes of cooking add shredded kale. 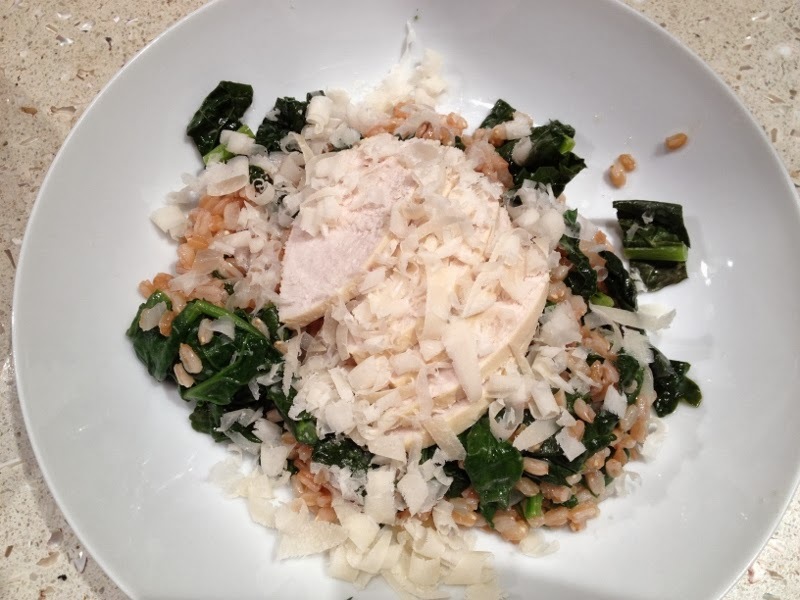 I served with a few slices of poached chicken breast, loads of cracked black pepper and some grated chilli peccorino. Heaven. Honestly folks this leaves regular risotto for dead. The spelt has a lovely nutty/wholegrainy flavour, and retains a good grain texture as well - no glugginess. It also reheated brilliantly the following day. Jerry was as verbose in his praise as it is possible for him to be about a meal with very little meat. He agreed it was much tastier than regular risotto, and said he would be happy to eat a lot more speltotto in future. Once the weather cools down a bit I am keen to try a version with roasted root vegies. I suspect it will be equally delish.